Stitching directly onto the required garment. 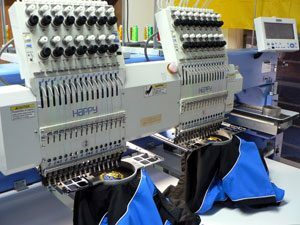 Our range of computerised 'Happy' embroidery machines are the latest technology in the embroidery industry. 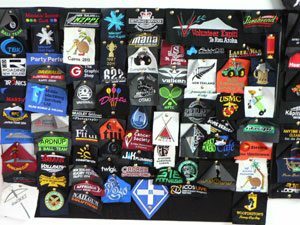 These state of the art machines produce outstanding stitch quality on all styles of garments: Polo Shirts, Tees, Jackets, Caps, Beanies, Badges and much more. An embroidery technique where we embroider a design onto a small piece of fabric that can be sewn onto a garment. 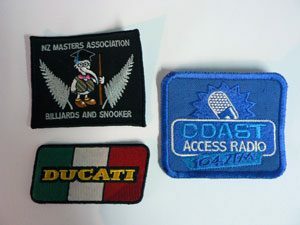 Badging can be used to cover over a previous design already on the garment. 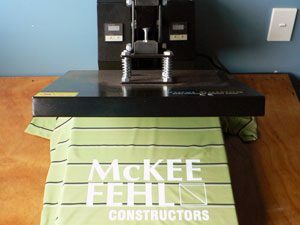 In house digitizing gives us full control of your logo creating precise stitching with great detail to every design. We use the latest Wilcom Embroidery Studio software. Computerised Vinyl lettering cut from our Mimaki cutter giving crisp lettering applied under extreme heat & pressure. Used when you require a different large name on a garment for each individual player of a team. 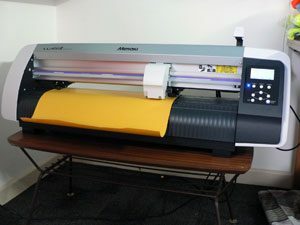 For those larger designs we use full colour printed Vinyl’s. Printed in Heat Resistant Ink onto Vinyl Transfer stock applied under extreme heat and pressure.